Lakeside, Private Jacuzzi hot tub. Wood burner. Boat. High-speed Internet. Popular with couples and families who enjoy lakeside living. 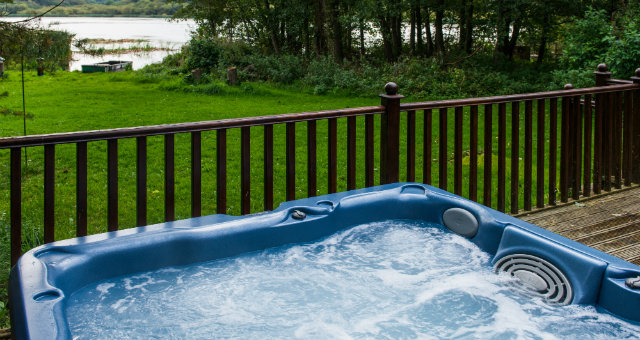 Buzzard Lodge has its own private Jacuzzi hot-tub and is right on the water. Enjoy a picnic on the deck or the boat. Walk around the lake through ancient woodland or plan day trips to the Lakes. You’ll love this tranquil retreat. Approach to the lodge is via path and a gentle ramp from the car parking space and entrance is via a side door. - Two 2-seater leather sofas. - Master bedroom with Sealey king size bed and lake view. - Twin Bedroom with twin Sealey beds that can be zipped and linked together to make a superking size bed – with lake view. 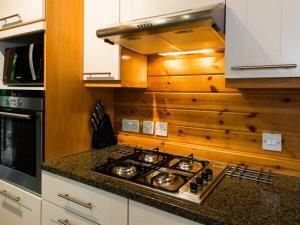 - Kitchen and open plan dining with seating for four. - Washing machine, dishwasher, large free-standing fridge freezer and microwave. 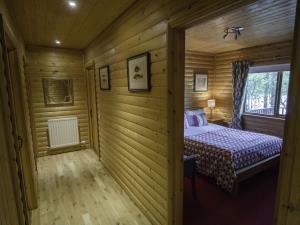 - Bathroom with WC hinged and fixed grab rails and wheel-in shower as well as a full-size bath. Buzzard offers weekly bookings starting on Friday and short breaks of 4 days starting on Monday and of 3 days starting on Friday. 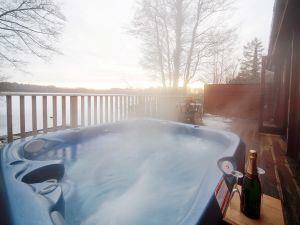 Love waterside living, luxury, hottub, sauna, internet? Egret Lodge is for you. Fabulous lakeside views from bedrooms and lounge. 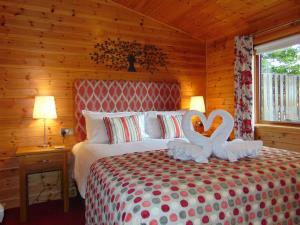 Egret Lodge is a spacious two bedroom lodge that is great for a family or friendship group who value their space. Hottub, sauna and lakeside deck with hottub. The Lodge has level access from the car and is set back with a grassed area between lake and lodge, the lodge feels secluded. Great for family with two children – great for granny too. Approach to the lodge is via a gentle ramp in front of the lodge from the car parking space and entrance is via a side door. - Open plan dining room with seating for 4. - Bathroom with full size bath and sauna. Egret offers weekly bookings starting on Friday and short breaks of 4 days starting on Monday and of 3 days starting on Friday.